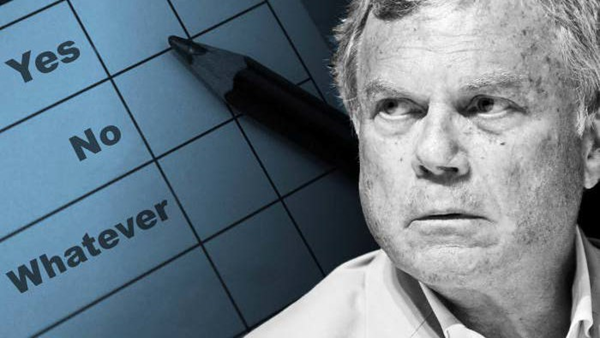 The pressure is on for WPP shareholders who care about governance. The advertising group recently parted ways under mysterious circumstances with Martin Sorrell, the man credited with building the company from a wire basket maker into a global marketing conglomerate. First the company confirmed that it was investigating a whistleblower’s allegations of “personal misconduct”. He denied wrongdoing but then quit abruptly 10 days later. WPP, which is treating his departure as a retirement and paying him £14m for 2017, has declined to say anything more about the probe other than to insist the amounts of money involved were “not material”. Now shareholders are being urged to punish the company for the way it handled Sir Martin’s departure. Glass Lewis, which advises shareholders how to vote at annual meetings, has recommended that investors vote against the re-election of the chairman over the succession issue and against the company’s pay plan. “We believe shareholders are unable to determine the extent to which he should be treated as a good leaver.” Institutional Shareholder Services, the other big advisory firm, has not yet made a recommendation. Good governance advocates are hoping that WPP’s shareholders will use its June 13 AGM to follow the example of investors in FTSE 250 construction group SIG. They voted last week to oust Deloitte after the company admitted repeatedly overstating its profits in previous years. Such moves generate headlines precisely because they are so rare. Over the past four years, director candidates for FTSE 350 and S&P 500 boards have won election with the approval of more than 97 per cent of the shares voted, according to statistics collected by Proxy Insight, a data provider. Auditors are generally reappointed with similarly high levels of approval. Shareholders tend to be somewhat less accepting when voting on “say on pay” resolutions and remuneration reports — on average, pay resolutions this year have been approved by about 92 per cent of shares voted in both the UK and US. In some ways, these levels of approval are perfectly appropriate. Most companies are run by directors who show up and do their job; most financial accounts are accurate and properly audited; and most executive pay plans represent honest efforts to tie long-term results to reward levels. But some shareholders have proved to be passive in cases where a bit more scepticism appears to be called for. Last month, shareholders in the UK’s Metro Bank were faced by complaints that the bank had paid £21m to InterArch, a design and architecture company owned by the wife of its chairman Vernon Hill, including £4.6m last year alone. The payments were all the more noteworthy because Mr Hill parted ways with the previous bank he had founded, Commerce Bancorp in the US, in 2007, after American regulators investigated very similar payments to InterArch. Although Glass Lewis recommended voting against Mr Hill’s reappointment, he received the thumbs up from holders of 96.5 per cent of the shares voted. Meanwhile KPMG has recently staved of investor eforts to oust it from the auditor position at not one but two of its longtime US clients. Fully 91 per cent of Wells Fargo shareholders approved the Big Four firm’s reappointment last month, despite another Glass Lewis call for change at the bank, which has been hit by scandals involving fake accounts and mis-sold insurance policies. A larger group of investors took a stand at General Electric’s AGM after the US industrial group announced that the Securities and Exchange Commission was investigating the way it recognised revenue. But KPMG still won approval of its reappointment from the holders of 65 per cent of shares voted. Shareholder democracy is often held up as a key principle of modern capitalism. Investor groups cheered when prominent equity indices decided to exclude app owner Snap and other new companies that issue multiple classes of shares with different voting rights. Too many shareholders fail to exercise their voting rights, including me. I’ve just remembered that there is a proxy ballot for an old employer that is sitting, neglected, on my desk at home. Too often, it takes a noisy activist to pique shareholder interest, as Nelson Peltz did last year at Procter & Gamble, and Carl Icahn has been doing recently at Xerox. That leaves us at the mercy of self-interested managers and equally conflicted activists. It’s time to stop being supine. I promise to fill out my ballot when I go home. You should too.